Ground Turkey Chili for Utopiafest! You might remember me telling you about Utopiafest. It is an awesome music festival that takes place every year in the hill country of Texas. The attendance is capped at about 2-3,000 and everyone gets to camp out for the weekend. And this year, this ground turkey chili made an appearance! Last year the weather was, well, a bit dreadful. It was held the first weekend of September. Have you ever been to Texas at that time of year? It is hot. Sweltering hot, to be exact. The high on the Saturday of the music festival was 96 degrees?! So this year when I found out the festival was being held the first weekend of OCTOBER I… was… PUMPED! October normally brings with it the first bit of cool weather. And sure enough, mother nature did not let us down. It was a magnificent 78 degrees during the day and a crisp 54 degrees at night. What I had not planned on, however, was that I would also have one heck of a cold. Have you ever been camping with a cold? 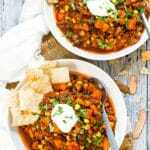 What makes this Sweet Potato Ground Turkey Chili so nutritious? Sweet potatoes are chock-full of Vitamin A and a good bit of Vitamin C, too. It is full of lean and mean protein. Ground turkey is a wonderful substitute for ground beef if you do not want all of the fat. Feel free to use ground chicken or venison for more healthy alternatives. Tomatoes make up the base of the chili. 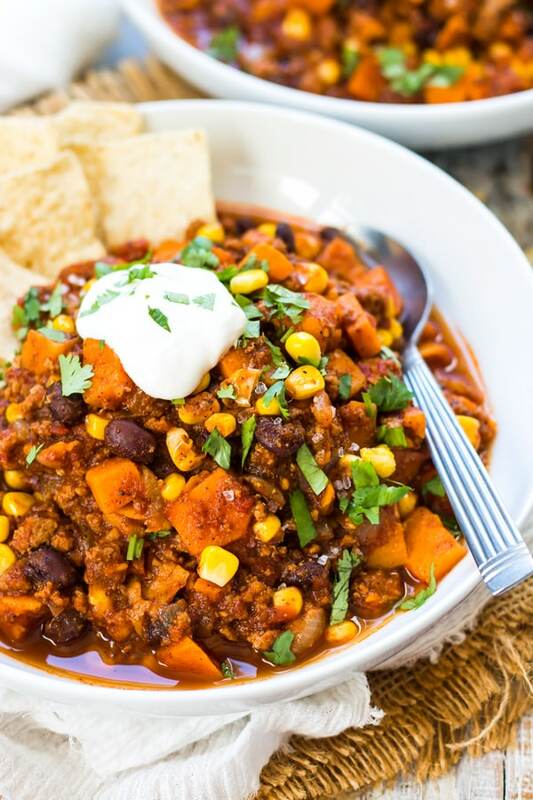 Tomatoes are also full of Vitamin A and C.
Loaded with nutrition and full of flavor, this sweet potato ground turkey chili is a win-win for the cold-weather seasons. 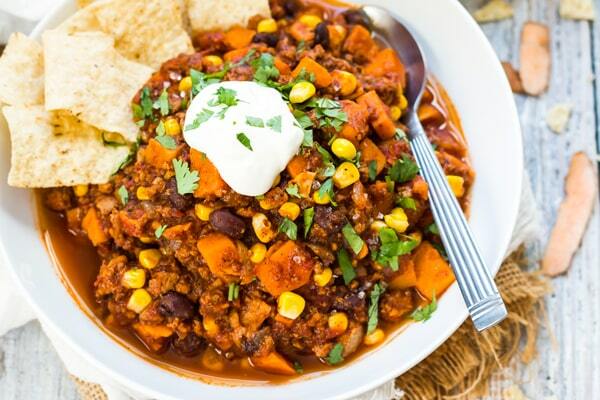 Want more recipes like this Healthy Sweet Potato Ground Turkey Chili? In a large saucepan, or large shallow pot, drizzle olive oil. Add onions and saute over medium heat for 2-3 minutes. Push onions to the side and add ground turkey. Continue cooking over medium heat for 6-8 minutes, or until turkey is almost cooked through. Add sweet potatoes and saute for another 2 minutes. In a small bowl combine chili powder, cumin, paprika, cinnamon, salt and pepper. Mix to combine. Pour crushed tomatoes, chicken broth and pre-mixed seasoning ingredients into the chili mixture. Mix chili thoroughly and reduce heat to a simmer. Cover pot and simmer for 20-25 minutes. Add drained corn and black beans. Cover and simmer for an additional 5-10 minutes. Check to see if sweet potatoes are fork-tender before serving. If you would like a slightly thicker chili, mash some of the sweet potatoes to help thicken it. Serve chili over rice with corn chips, cilantro and sour cream and enjoy! See this recipe in Healthy Meal Plan #2. I made spinach artichoke spaghetti squash boats with chicken last weekend and sweet potato ground turkey chili tonight. Both were delicious!!! Thank you so much! Oh I also made some refrigerator oatmeal with brown sugar and maple syrup and toasted pecans. I cut back on the sugar but it was still too sweet for me and I wondered if I misunderstood the recipe. It was really good though. I already get your newsletter. I love it and I really appreciate your recipes. Wow you are a good cook! Love your recipes. Wondered if your snicker doodle cookies will freeze well? Thank you so much, Lynne!! If you would like to freeze them, I would freeze the cookie dough (already rolled in the cinnamon/sugar). When you are ready to bake… take them out and either let them sit at room temperature for 10 minutes and bake as instructed, or bake them for a minute or two more straight out of the freezer! Hope this helps! I made this chili specifically intending to hoard it for myself bcc my family is a bunch of picky eaters. I made it when they went out to go swimming and when they came back and smelled the aroma they all wanted a bowl (sigh) so I had to share….and they loved it so I was super happy. Do you think you could Substitute sweet potatoes with butternut squash? Or would they take way longer to cook? Absolutely! It may take a few minutes longer, but should still turn out great! This was sooo tasty!!! Just ate as is and was so flavorful! Thanks for the recipe!! Would it be possible to cook the recipe in a slow cooker? 4/6 hours on low? I tried this in a crock pot tonight (however I did cook the onions and the turkey on the stove then added to the crockpot with all the other ingredients + an extra half cup of chicken stock) and it came out great! My husband and I enjoyed this meal and we will definitely be making it again! P.s. I cooked it on high for about 2 hours to soften the potatoes sufficiently, then mashed as advised for a thicker consistency. Hi Elisia! Thanks so much for the feedback on how you made it in the Crock-Pot! It’s so nice to have options on how to prepare a recipe. Thanks for your comment and rating! How much is in a serving? 1 cup? Yes, roughly about 1 cup. This chili is so flavorful and filling! I was skeptical about eating a tomato based sauce and sweet potatoes together but it works so well and I think gives it that texture you would normally get from a lot of beans. I will definitely make this again and again!! This has quickly become one of my go to recipes! I made it for my boyfriend, and we’re both obsessed. We make it almost once a week now! I made it for my family when I was home for the holidays and they loved it so much that they make it regularly now, too! This is one of my new favourite recipes. I was surprised I didn’t have to change the recipe but that it allows for subbing chicken for turkey . Is T for teaspoon or tablespoon ? Hi Stefanie! T is for tablespoon 🙂 Thanks for the question! 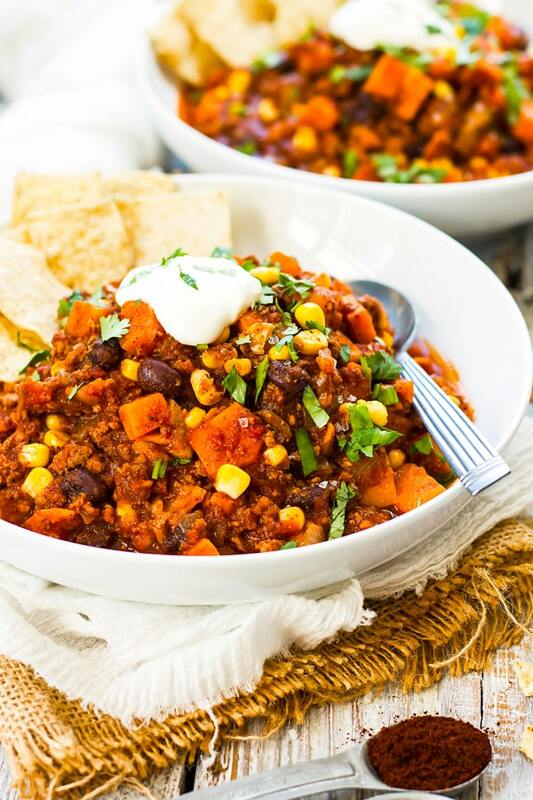 Would your HEALTHY SWEET POTATO GROUND TURKEY CHILI freeze well? Hi Jill! Yes, it will freeze great! Make sure to put it in a well-sealed container and thaw it in the refrigerator when ready to eat! I made this for dinner last night and we loved it! My husband kept saying how good it was. I like it better than better our long tme favorite chilli recipe. Thank you so muchfor sharing! Yay Nancy!! I am so happy your hubby loved it. And that is quite the compliment 🙂 Thanks so much for your comment and feedback!! So so happy you enjoyed it, Roberta! I’ll definitely have to try this in my Crock Pot next time 🙂 . Thanks so much for the comment and rating! This was absolutely delicious, my husband was very hesitant about “sweet potatoes in his chili” well, he’s a believer now. He’s a happy camper Football and chili. Next time I’ll double it. Thanks for this delicious and healthy recipe. That’s awesome, Lisa!! I’m so happy it passed the “hubby test”. LOL. Thanks so much for your comment and rating!! Was searching for a GF recipe that could feed, nourish, and actually fill up my teen son. He LOVED this and said he was actually full (imagine that 😉 after a bowl — or two — of it. I knew enough to make a double batch. It will be a staple in our household. Thanks!!!! Also, I added a few handfuls of kale (pre-washed/cut from Trader Joe’s–just took off the hard rib parts), and a little extra salt. Tasty! Now, on the lookout for another filling, nutritious dish I can put into the rotation. That’s amazing, Michelle!! It’s hard to fill up a teenage boy! I love your idea to add kale, too. What a great way to add a bit more nutrition. Thanks so much for your kind comment and rating!! I know it says sweet potato but the picture definitely looks like yams. Hi Adelle! Not sure where you live, but these are “sweet potatoes” in our part of the world! Yams will work great in this recipe, too! So tasty, London! Turkey chili with sweet potatoes is the first dish I make as soon as fall begins, and your recipe is lovely. Did about half the corn cuz I wanted to add a little chopped kale right at the end. Also used a turkey bone broth instead of chicken broth (for the protein). Even a small bowl of it is so warm and filling. Perfect. I love this recipe! I’m enjoying a bowl of this chili as I type! I would maybe add two or three cloves of finely chopped garlic, however. This would make it even more savory and flavorful. Happy fall! Oh yes! Garlic makes everything better. Thanks so much for your recommendation and comment! I love this recipe..thank you so much…. Yay, Rachel! So so happy you enjoyed it. Thanks so much for your rating and comment! I have made this a half a dozen times when hosting and my guests have raved about it every time! Yay, Sara!! I am so happy you and your guests have enjoyed it 🙂 Thanks so much for your sweet comment and rating! Just came across this recipe it smells good but its taking a long time to soften the sweet potato I’m well over the initial cook time. Am I missing something? Or maybe can I used can sweet potatoes instead? This was delicious! Loved by the whole family! This is my new, go-to chili recipe! My husband & I love this and have made it at least half a dozen times since finding it last fall. I’ve used ground turkey, chicken & sirloin and all have been delicious. The spice blend is on point for a mild chili flavor that should work well for just about everyone’s tastebuds. I’ve yet to master the cooking time with the sweet potatoes IN the pot (or crock pot, which is usually what I use to make this so it’s even easier to pull together after pre-browning the meat), but I easily roast them separately in the oven. 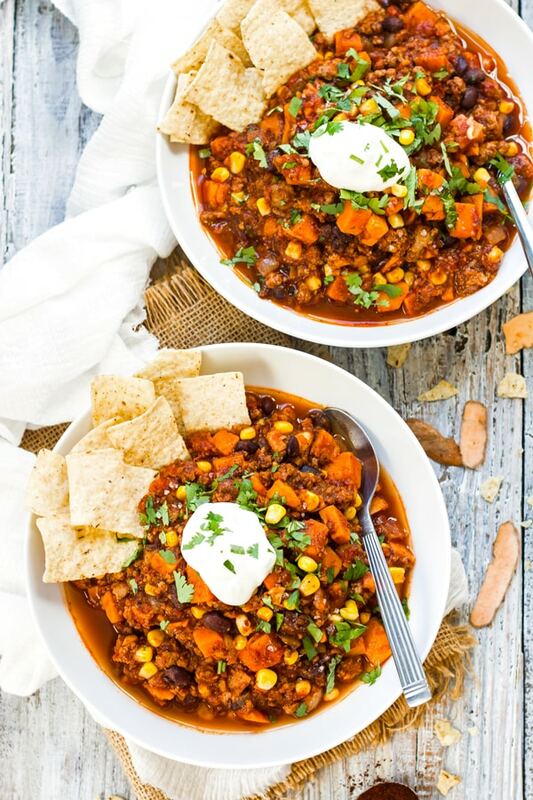 That worked out well when we served this to guests since they could decide whether to add the sweet potatoes–the chili is delicious with or without them. I usually buy the pre-cubed taters in the produce section to reduce prep time. Butternut squash can also be subbed. I often double the recipe & freeze half for future dinner goodness, so this definitely freezes well. Thank you for sharing this recipe–it’s so easy, yummy, and on regular rotation at my house these days!